Still not known how barge covered in old cars and appliances caught fire. A raging barge fire on the Surrey side of the Fraser River has triggered an air quality advisory across Metro Vancouver due to "intermittent high concentrations of fine particulate matter." 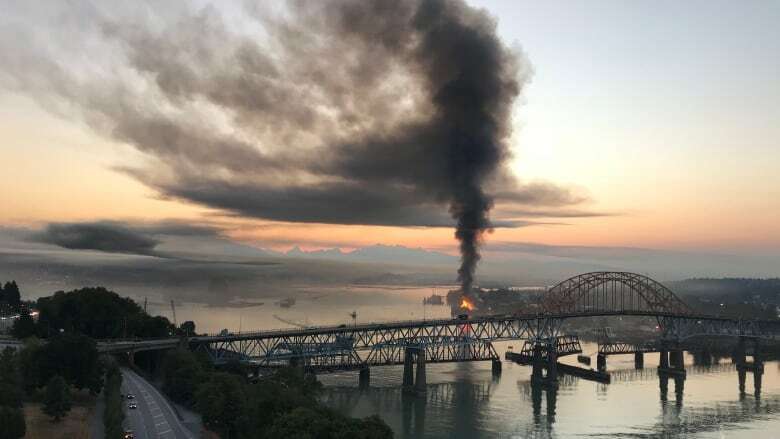 The huge blaze at Schnitzer Steel near the eastern foot of the Pattullo Bridge broke out early Friday in a massive pile of scrap cars, appliances and metal floating on the river, spreading acrid smoke across the region. "It's a challenge to get access to this fire because three sides are surrounded by water," said Surrey Deputy Fire Chief John Lehmann. "The barge is probably 250 feet in length and the fire is burning in the middle of it. Given that our crews could only access it from the ramp, we're only able to get water on the front portion of the barge at this time." A fireboat from Vancouver and tug with water spraying capability are also assisting in the effort. 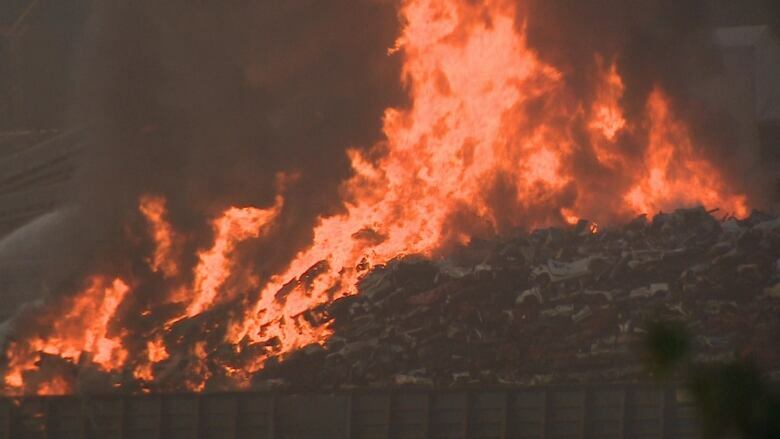 An official from the Vancouver Port Authority said Friday afternoon the fire is now contained and isn't in jeopardy of spreading. In a written statement, Schnitzer said the cause of the fire is still under investigation. "The barge was comprised of crushed auto bodies that had been drained of fluids and properly processed for end of life, and assorted light iron such as washers and dryers," said company spokesman Colin Kelly. Schnitzer Steel is an international metal recycling and steel manufacturer based in Portland, Oregon. Witnesses say they heard a number of small explosions and the huge plume of dark smoke was visible from kilometres away. "The scrap material likely contains plastics and upholstery — that's what's burning, not the metal itself," said Lehmann. AMIX Group, a neighbouring business, sent its employees home due to the heavy smoke. "We've shut down our site ... because of the air quality," said CFO Rob Dhari. Burnaby resident Teresa Heitzmaan said she rushed over after finding out about the fire, worried for her mother who lives three blocks away in the Bridgeview neighbourhood of Surrey. "She has a sleep apnea machine ... and we phoned her 10 times to inform her to shut the windows," she said. "It's not a good smell. 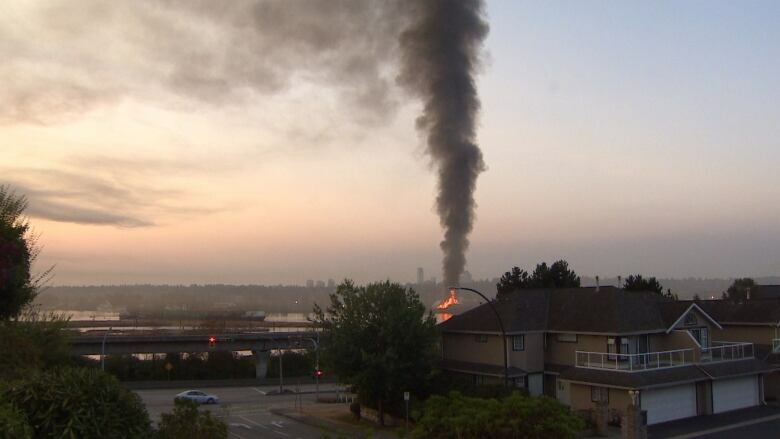 It's like a chemical smell and we could see from the [Pattullo] bridge that a barge with cars was burning." One onlooker told CBC News that flames were shooting over 20 metres into the air at the height of the fire. The fire was called in a 4:40 a.m. PT.